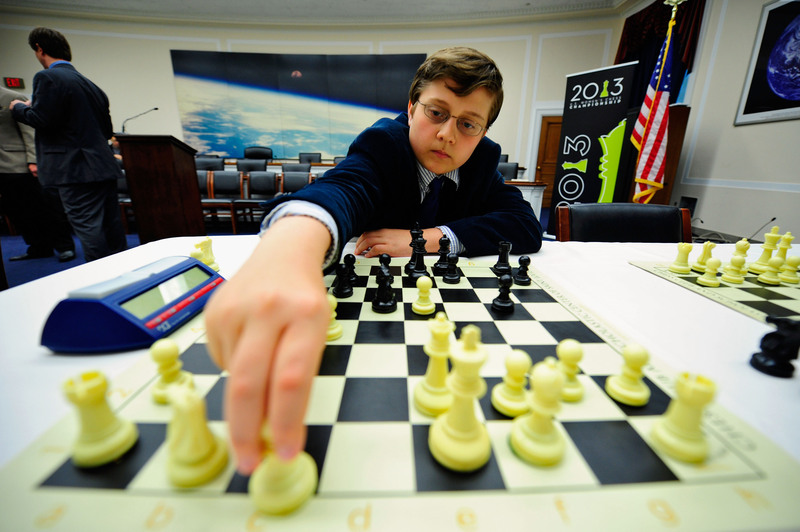 IM-elect Sam Sevian, 12, is the youngest player ever to participate in the U.S. Championship. For a good percentage of the field at the 2013 U.S. Championship and U.S. Women’s Championship, victory would mean fame, a huge payday, and a soft-drink with dinner. That’s because many competitors of both tournaments are first-time contenders, some still in their teens and precociously competing against battle-tested veterans. One player who was completely surprised at the invitation was WFM Sarah Chiang. Though she is a veteran of competing for the U.S. in World Youth Championships, and has already trained under two world champions, this will also be her first championship. “I thought playing in this year’s U.S. Women’s Championship was out of reach since I was ranked 19th on the women’s list,” Chiang said. The 15-year-old received a wild-card invite, and she offers some new blood in an event that traditionally has less turnover than the U.S. Championship. Surprisingly, she has never played any of the other nine women in a tournament. She said she expects there to be more pressure in Saint Louis than when she competes internationally. “There are fewer players in the field, which means that each player will receive more attention than at a tournament like the World Youth,” she explained. Chiang is right – her games will be broadcast in real time all over the world, and players traditionally come down to give live interviews and game analysis with the broadcast team. Going down the age list, 14-year-old IM Kayden Troff is fresh off a gold medal at the previous World Youth Championship. Like many of the other juniors, he’s been to Saint Louis before and has nothing but praise for the host Chess Club and Scholastic Center of Saint Louis. ”I think it is great to see the club and the way those involved are actively seeking to popularize chess,” Troff said. Troff comes from Utah, a state not usually known for producing chess prodigies. He’s happy to buck the mold, which he did with a focused dedication to the game. “For me, I would say I definitely have some natural talent, but I think putting in a lot of work is probably the main reason I am where I am today.” Many strong juniors have had strong chess-playing fathers to guide them (Bryant’s stepfather is GM Enrico Sevillano), but Troff’s dad actually got better simply to teach his son. Troff credits his father’s dedication for his own success (Dan Troff does not compete much but has a provisional rating in the 1300s, while several of Kayden’s brothers have achieved modest chess success as well). It doesn’t hurt that he comes from good stock. Sevian’s ancestry is Armenian, which could perhaps be the most chess-infused country in the world. Their national team has won gold at three of last four Chess Olympiads, their president flies home the grandmasters in his personal plane, and chess is mandatory in the school system. Although he has lived all of his life in the U.S., Sevian’s work ethic holds chess in similar esteem. In this sense he is not entirely different than the other youngsters. By his estimates, Sevian spends six or seven hours a day training (he also does physical conditioning too). Troff is homeschooled and puts in a similar amount of time. Chiang attends school online but still spends a few hours daily on her chess. She is thinking of taking a year off after high school to focus on chess; Bryant is currently on break from college to devote himself to the game. There are several other first-timers at the 2013 U.S. Championships. These young guns look to be the future of American chess, and fans may one day look back on this year as the moment when one or two of them graduated from scholastic superstar to top-level American player. Of course this time he will be come into the tournament ranked 24th, last in a crowded field of grandmasters and other promising juniors. Sevian has been in this exact situation before. At the 23rd Metropolitan Chess FIDE Invitational in December, Sevian, the only untitled player, was ranked last in the ten-player field. He promptly scored an undefeated 6/9, tied for first, and became an International Master.